Learn how Fast Plants reproduce. Flowers bloom! If pollen is passed from flower-to-flower, pollination occurs. Pollen that lands on the tip of another flower’s pistil grows a tube down into the pistil, where the eggs are housed. Sperm (from inside the pollen) then move down the tube until they reach the eggs and fertilize them. 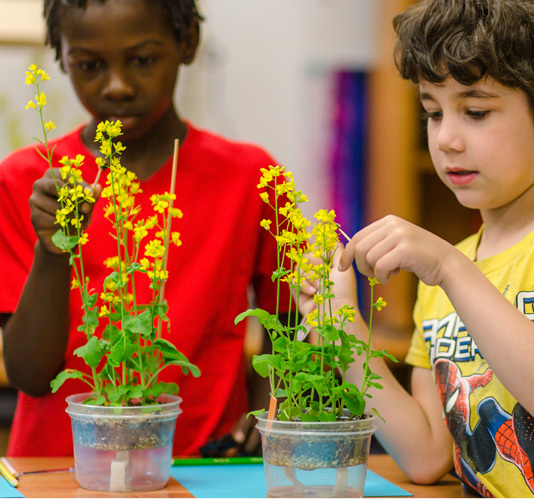 Pollination activities engage students actively in spreading pollen among plants using a bee stick so that they successfully reproduce and develop seed in the next stage. 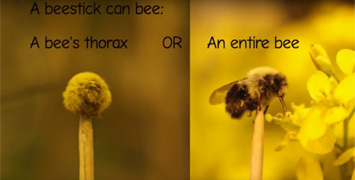 (Alternatives to the bee stick, such as a cotton swab or commercially supplied pollination wand can also be used). During the pollination stage, activities can link students’ use of bee sticks with explorations into the interactions of plants and insects. Bee sticks can be made from whole bees or just the fuzzy thorax (mid-section) with or without the wings. Alternatives: Cotton swab or commercials suppied pollination wand. 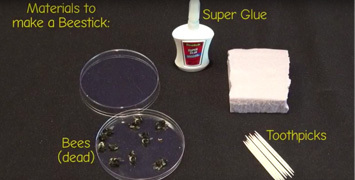 Use a drop of glue to fix the bee thorax to a toothpick. Let bee sticks dry overnight. Pollinate with the bee sticks by brushing the bee over flowers to pick up and pass around the pollen among different plants. Fast Plants® do not self-pollinate. Beesticks should be made one or two days prior to pollination. 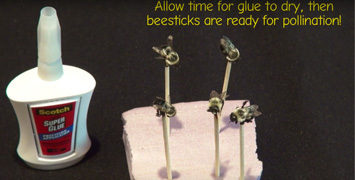 When making beesticks the bees may be very dry and brittle. Soften the bees by placing them in an airtight container with a little moist paper towel overnight.